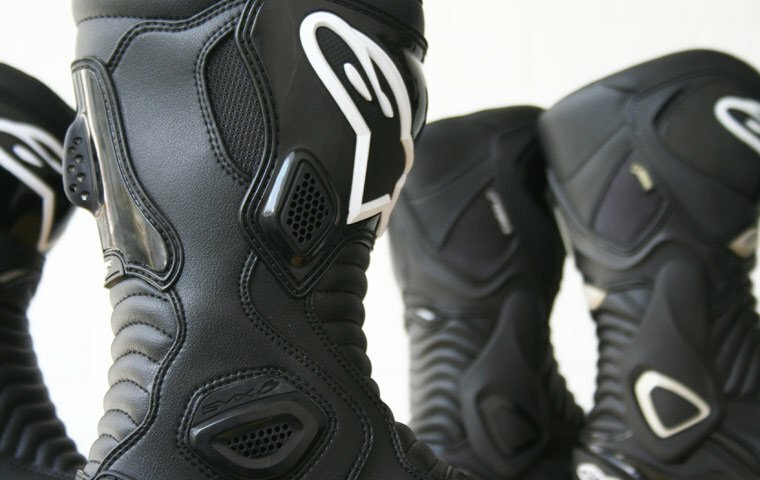 Updated, waterproof sports riding boots. Aggressive looking, hard protection & superior Gore-Tex breathable waterproof membrane. These waterproof boots are a redesigned and updated version of some of the most popular sports boots around. The SMX-6 V2 Gore-Tex boots have had a facelift and now you can actually see some of the internal elements that protect your feet. More comfortable and more protective than the earlier best-selling model, the SMX-5s. Every part of this boot has been carefully constructed with passion: from a bio-mechanical outer bracing system (similar to the top-end sports boots with a double hinge system fixed on the outside) to a sole that disperses water. The foot bed is constructed from EVA with Lycra which is removable and replaceable if necessary, unlikely considering the quality you get from Alpinestars. The sole means that less water stays on the bottom of your boots, great for prolonging it's life and to stop those potential slips when riding. These boots are the Gore-Tex version of the new SMX-6 V2 range and feature a full Gore-Tex membrane. Gore-Tex is a breathable, waterproof membrane that offers the best levels of breathability while being 100 percent waterproof. Meaning, your feet stay dry from the rain and stay dry from sweat. The use of Gore-Tex shows, once again, that Alpinestars spare no expense when it comes to quality.